Exercise this week: daily dog-walk; Wednesday, C25K training; Thursday, lots of steps in London (! ); Monday, C25K training (w2 d1 – 1.5min running intervals); Tuesday, HIIT circuits. Bits where I had to think: Dinner out in London on Thursday, afternoon tea in London on Friday, dinner out on Saturday – planned it in advance so I had zero-point breakfast and dinner on Friday in particular. What needs to change next week: nothing – keep up the good work! Steam the cauliflower, then mash it. 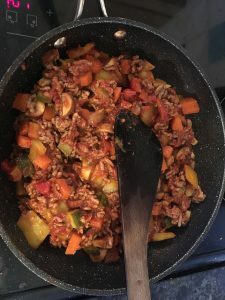 While the cauli’s steaming, brown the mince in a pan (if it’s non-stick you won’t need oil); then drain the mince, add all the other ingredients except for the cheese, and simmer for 30 mins until the carrot’s soft. Place the mixture in a large casserole dish, top with the mashed cauli, sprinkle the cheese on top, and bake at 180 degrees for 40 mins.